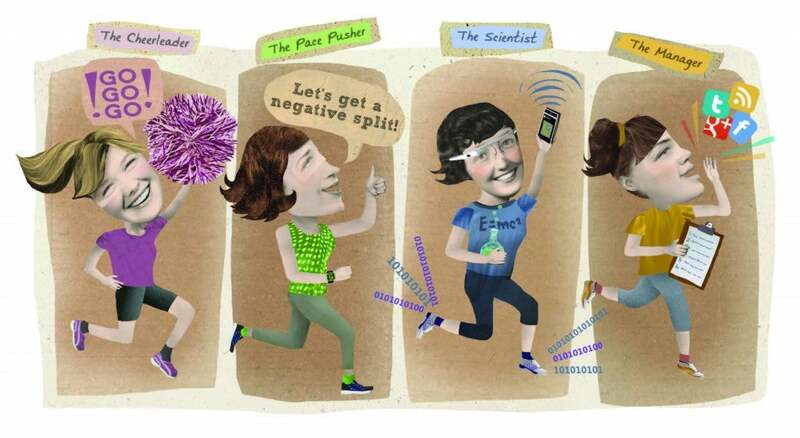 Which One Of These Running Buddy Types Are You? Certain type of running buddies are great when runs get rough. Do you have all of these awesome archetypes in your life? From the lab to the trails, research has demonstrated the many benefits training partners can offer. Not only do running buddies keep you accountable, but they also make even the hardest workouts fly by. They’re the girls who get us out of bed on the days we’d rather sleep in and encourage us to press on when we’d just as well give up. The right buddy can make training more fun and also transform you into a stronger, faster runner. Check out our picks for the top must-have run buds and consider where you or your friends fit the profiles. Better yet, if you’re in search of workout pals, this is a good place to start. This is the runner who always sees the glass as half full, no matter the circumstance. “Even at 5:45 in the morning when it’s 15 degrees and windy outside, the cheerleader still has a good attitude,” says Pugh. “She always has a smile on her face and is the one rallying people before workouts.” Even the most devoted runners have days when they are less than thrilled to be out pounding the pavement, so having a partner who gives off positive vibes raises the morale for the entire group. This person encourages others to challenge themselves. “This runner can push you out of your comfort zone and show you that you’re capable of achieving higher goals,” says Kelly Bails, a USATF-certified coach based in Illinois. “You’re less likely to back off the pace if you are running with this person, so you’ll go faster than if you were running solo.” We all have moments during hard workouts when we’d like to let up – the pace pusher is that buddy who helps you stick to your goals. It often comes in handy to have a self-made expert in the group. From training methods, to the latest injury cures, to expertise on training gadgets, the scientist is a voracious consumer of running media. Bails says, “The science of running is constantly changing, and everyone needs someone who can stay abreast of that knowledge.” What’s more, the latest in show technology and GPS training devices can be daunting if you don’t have a person in your running group who keeps you up to date. “This gadget queen in definitely methodical about staying current on the latest technology and understanding the newest apps.” says Pugh. You can count on the manager to organize group runs, from when, to where, to what. “These are the people who will post messages on Facebook to remind others about upcoming runs,” says Pugh. “They provide great accountability for the group.” Since sticking to a training plan can be tricky, you’re less likely to scrap a track workout for an easy day if you have a manager insisting on following the schedule.